Vonnegut will always have a special place in my heart. He was my first favorite liberal philosopher author with whom I fell madly in love. His writing honest, humorous, and incredibly intelligent. Vonnegut has got this knack for conveying more ideas in one short sentence than most writers can in an entire novel. His words are powerful and memorable. Although he held a pessimistic view of politics and the modern day world, he believed in the good of human kind. 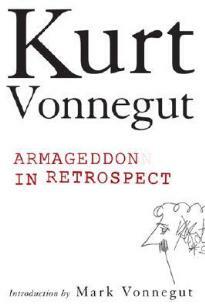 I have to say this wasn't my favorite collection of Vonnegut's - some stories outshine the others - but it's worth the read, nonetheless. If you're new to Vonnegut's essays, I would suggest starting with A Man Without A Country. It isn't his best, but I enjoyed it immensely. I love Vonnegut, too. I've never read Vonnegut. How embarrassing is that? Very! I love him, but have not yet gotten to any of his essays. Looking forward to this one, love the title.